El Capitan is the most impressive wall on earth. It’s 32,000 ft of sheer granite and the centre of the rock climbing universe. 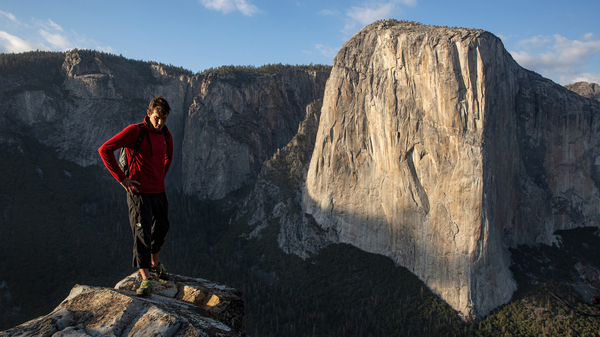 For Alex Honnold – the world’s most accomplished Free solo (ropeless) climber - El Cap presents the ultimate challenge, a goal he has been dreaming about for years. Watching Alex climbing without a rope through awkward and difficult positions on minuscule holds in which one wrong move would be fatal, is a breathless, nerve shredding experience. It’s also a brilliant account of the process of moving through fear as beyond each immediate physical challenge lies another, and then another, stacked to the sky. Meanwhile the trees below shrink to dots. Followed by a live satellite Q&A with Alex Honnold and directors Elizabeth Chai Vasarhelyi & Jimmy Chin. Free Solo will also screen from Fri 21 - Mon 31 Dec.
One of climbing’s most extraordinary feats is captured in this stunning, scary and unflinching documentary about free soloist climber Alex Honnold as he prepares to achieve his lifelong dream of climbing the 3,200 ft face of El Capitan in Yosemite National Park... without a rope.